MyPC enables you to book a PC in the independent study room in the Harmonie Complex (1313-0240). This means the PC will then be available to you only. Go to https://mypc.service.rug.nl and log in using your S number. Follow the instructions in the manual below. 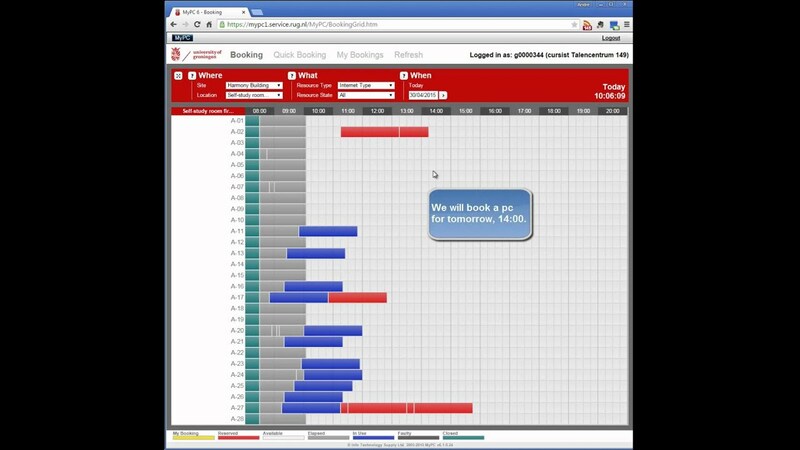 You can also use your smartphone or tablet to make a booking. By default you will be presented with a simplified user interface, in which you cannot select a specific computer: this is done by the sytem. However, if you click on "Full view" under the login button on the MyPC homescreen, you will see the normal view where you can see if your favourite computer is available. If you enter the study room without a booking, it may be difficult to quickly find a computer that is not already booked. To help you find one, a special MyPC Kiosk computer was installed in the room. You can only use this computer to log in to MyPC and find and book a computer. You will find a manual next to the Kiosk. You can extend your booking (provided the PC is not booked after your session) up to 10 times with up to 60 minutes at a time. You will receive a reminder about this 10 minutes before the end of your booking, but you can also extend your booking immediately by opening the MyPC notification bar at the top of your screen. The options above are subject to change without notification. If your session has ended, you will automatically be logged off. Do not walk away from the pc without saving your work. Open the MyPC notification bar at the top of your screen tosee how much time there is left until the end of your session. If you have finished working on the pc, log off first and then turn of the computer. It will then immediately be available for other students. Download the MyPC manual to book a PC. The film below will show you exactly how to make a booking. N.B. There is no spoken text in this film. Last modified: 20 September 2018 4.56 p.m.